Making the Leper Clean: A Challenge For All of Us." On this final Sunday before Lent we are presented with two readings that deal with leprosy. In the first one from Leviticus (Leviticus 13:1-2, 44-46) we see the prescriptions describing how a leper is to be declared "unclean" and forced to live outside of the community. In the ancient world this disease was a terrible scourge and it was sound public health policy to do this. Many people who were not leprous suffered, however, from this practice. People with acne, psoriasis or other skin conditions were often falsely put into this state of uncleanness, not to mention the families and friends of the leper. We now call this disease Hansen's disease and we know that it is much less contagious than was thought by the ancients. 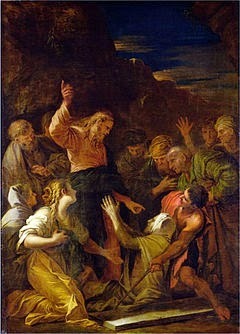 In the Gospel (Mark 1:40-45) a leper says to Jesus, "If you wish, you can make me clean." Jesus responds, "I do will it. Be made clean." As wonderful as it was to cure a leper, Jesus was doing much more than that. In making the man clean he was restoring his relationship to his family, friends and the community in general. What we need to realize is that this was at the heart of Jesus ministry. He does not perform miracles to show off. They are performed to heal and restore not only physical health , but broken relationships with God and with others. That is why He also forgives sinners. And what might you and I learn from this story? We need to move off being awestruck by the miraculous element of this curing and realize that in making the leper clean Jesus is beginning a ministry of inclusion, of bringing back into the community those who were cast out. We need to ask "Who are the lepers of today?" We might start with the victims of AIDS who, especially when this disease first became known over 30 years ago, were victimized not only by the disease but by the fear, prejudice and ignorance of too many people. We could likewise take a look at others who, while not suffering from a physical illness, are cast out, not formally, but by social rejection. Pope Francis has called attention to the plight of immigrants in Europe, the Middle East, and in our own country. Sometimes we stigmatize the poor and the homeless. We stigmatize them and blame them for their condition. While I think the question, "What would Jesus do?" is often trivialized and overused I believe that it applies here. I don't think that Jesus would want to remove all public health and security measures, but He would call us to realize that every one of the above mentioned people are just that, people, human beings, our brothers and sisters. He would ask us to realize that they are suffering from poverty, rejection, disease or any combination of the three. He would ask us to do what we can to bring them back into the wider community. He would ask us to realize that even if some of them had to be in prisons, or hospitals, that they are still our brothers and sisters, in need of forgiveness or healing, and that whatever else they are, they are not just "unclean". "I do will it. Be made clean." He said it then, and He says it now.